South Africa and apartheid was placed on the agenda of the United Nations for the first time in 1946 by India regarding the treatment of people of Indian origin living in South Africa. In 1952 apartheid was again raised, this time in connection with the wider question of race conflict in the country in reaction to the ANC Defiance Campaign. The South West African question was also on the agenda annually as from 1946. Initially the South African government responded to comments on its policy by saying that apartheid was part of the internal affairs of the country, and for this reason fell beyond the scope of the United Nations. Many Western countries agreed with this claim, but nonetheless continued to hold discussions and appealed to South Africa to change its policies year after year. In 1960 the worldwide view changed as a result of the Sharpeville Incident. As from this point many Western countries no longer held the view that apartheid fell within internal affairs and they began to openly criticise South Africa. On 1 April 1960 the Security Council also discussed the issue, and recognised that it might be a threat to world peace and security. They called upon the government to introduce measures to bring about racial harmony. The South African government instead reacted with banning the ANC and PAC. From this point on the UN decided to follow steps to try and ensure the following of the UN Charter inside South Africa. In 1961 United Nations Secretary-General, Dag Hammarskjold visited South Africa, but reported back that he could not come to an acceptable agreement with the Prime Minister. In the same year H.F. Verwoerd announced South Africas withdrawal from the Commonwealth of Nations as a result of criticism from this organisation, and the Foreign Minister was criticized for his speech in the General Assembly. In 1966, the first of many UN seminars on apartheid was held in Brazil, and later in the same year the General Assembly proclaimed 21 March to be International Day for the Elimination of Racial Discrimination in remembrance of the Sharpeville Incident. A 1971 General Assembly resolution condemned the establishment of homelands. In 1974 there was a resolution to expel South Africa from the United Nations as a result of human rights violations, but it was not accepted as France, the UK and the USA did not support it. The one possible form of action against South Africa was the introduction of economic sanctions and the isolation of South Africa. Sanctions were often discussed and supported in the UN, and many recognised them as an effective and peaceful means of pressure. However, the main trading partners of South Africa continually voted against the introduction of mandatory sanctions in the Security Council. In 1962 the General Assembly asked that member states break diplomatic, trade and transport relations in an attempt to convince South Africa to abandon apartheid, and again in 1968 they asked for the suspension of all cultural, educational and sporting exchanges. In 1963 the Security Council called upon states to stop the sale of arms to South Africa, and repeated the call in 1970 (when only France, the UK and the USA abstained from voting) and again in 1972. It was however only in 1977 that the arms embargo became mandatory, and other sanctions were still not in place. 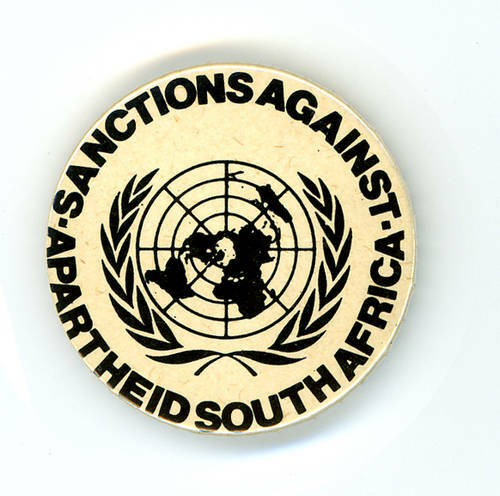 The year 1982 was declared International Year of Mobilisation for Sanctions against South Africa by the General Assembly, with a new programme of action being introduced the following year. In 1985 the Security Council called on members to introduce more far reaching economic measures against South Africa, but a draft resolution of selective sanctions was vetoed by the UK and USA in 1988. Another form of possible assistance from the UN revolved around assisting the victims of apartheid. In 1963 the General Assembly passed a resolution calling on states to contribute to funds assisting victims of apartheid. The Special Committee Against Apartheid was set up in the same year, with a Centre Against Apartheid being established in 1976 and 1978-9 being declared International Anti-Apartheid Year. Many countries did adhere to this call, and some private contributions had even been provided prior to the United Nations call. In 1972 the Security Council made a similar call for contributions and recognised the legitimacy of the struggle against apartheid. The next year they recognised the freedom movements as the true representatives of the majority of the South African people. In 1989 the General Assembly adopted the "Declaration on Apartheid and its Destructive Consequences in Southern Africa," calling for negotiations to end apartheid. It can be seen from the above discussion that the UN continually failed to take steps to being apartheid to an end. Despite continuous condemnation and criticism of the policy, mandatory sanctions were never introduced. The main reason for this lies in the fact that the five permanent members of the Security Council have the right to veto, and Britain and the USA were not in favour of mandatory sanctions and so could continually veto this move. The role of the Cold War in decisions is also evident. Sanctions needed to go through the Security Council rather than through the General Assembly. South Africa first took over control of Namibia, then called South West Africa, during World War I when it was still a German colony. After the war South Africa received the country as a mandate under the League of Nations. In April 1945, at the first meeting of the UNO, Smuts hoped to get the go ahead for the incorporation of Namibia into South Africa. This would allow him to do by lawful means what many felt he should have done during the war. The General Assembly not only rejected Smuts application, but also insisted that the mandate be brought under the UN Trusteeship Committee like all other mandates and Smuts had to agree to submit reports to this committee. Confrontation over Namibia increased in the 1950s, and in 1951 the UN appointed an ad hoc committee to negotiate with South Africa over Namibia. The negotiations failed in 1952 and South Africa withdrew from the Trusteeship Committee and protested against continued UN intervention. South Africa was convinced to return in 1957 after a new committee was set up, but its proposals regarding the partition of Namibia were unacceptable to both the Trusteeship Committee and the General Assembly. The National Party, during the apartheid period, wanted to include Namibia as a fifth province in the Republic of South Africa. The National Party hoped to gain more votes in this way and increase its majority. In 1959 the UN found that South Africas administration went against the principles of the UN Charter, the Declaration of Human Rights and the advisory opinion of the International Court. South Africas violent actions in Windhoek after some black people protested against being moved to a new area led to the UN appointing a one-man commission and African states starting actions through the International Court. The UN called on South Africa to lift all apartheid laws from Namibia and told the Trusteeship Committee to visit Namibia with or without the permission of South Africa. This proved difficult, and the UN eventually agreed on the formation of a seven-nation committee that would visit Namibia before 1 May 1962, prepare the country for the removal of South Africa and free and democratic elections so that Namibia could become independent. The UN would provide technical assistance and would ensure freedom for political prisoners and an end to discriminatory laws. South Africa assisted the committee in their visit to Namibia, and they found that South Africas administration of the area was not against the mandate system or a threat to peace. However, after leaving South Africa the same committee changed its findings, but action at this stage was difficult as the case was before the International Court. In 1962 the court decided that it did have jurisdiction to try the case and it started to look at the record of South Africas action in Namibia, heard reports on the treatment of the people there and looked into the restrictions placed on black people in the country. During the hearings, which took six years, the one judge died and was replaced with a judge with more pro-South African ideas. It was eventually found, by a majority of 8 against 7, that the countries that brought the case before the court had no standing. This bought South Africa more time as otherwise the UN would have found itself in a position where it needed to start sanctions or other actions against South Africa. The decision brought caused an outcry in the General Assembly, which called on the Security Council to put pressure on South Africa. The Security Councils first action on the issue was in January 1968 when it demanded that 37 political prisoners be released. In 1969 it recognised the General Assembly resolution of 1966 ending South Africas mandate over Namibia and calling for South Africa to leave the area. It saw South Africas refusal to do so as an aggressive action against the authority of the UN. The Security Council asked the International Court for the opinion on South Africas continued occupation in 1970. In 1971 the International Court of Justice gave an advisory opinion finding South Africas occupation of Namibia illegal and after this South Africa was defying the United Nations in her continued occupation of Namibia. The UN declared that South Africas mandate over Namibia was terminated. South African armed forces continued to occupy Namibia. The UN did not accept the proposal by South Africa to hold an all-races referendum in Namibia to test the popularity of the continued mandate. In 1971 the Security Council called on the Secretary General, Kurt Waldheim, to make contact with all people of Namibia and to prepare for self-determination. Waldheim went to South Africa where he met with and had talks with Vorster. He also visited Namibia and held talks with different groups in that country. In Namibia a Convention was held between all the groups that wanted the immediate withdrawal of South Africa, and Waldheims representative met this Convention at the end of the year. Discussions were underway, until a deadlock was reached in 1973 when the Security Council called for an end to Waldheims mediation. The Convention called for the immediate withdrawal of South Africa, and the Security Council echoed this call in 1974. On 16 December 1974 the General assembly recommended that South Africa be excluded from participation in international organisations as long as it continued to practice apartheid and ignore the UN regarding Namibia and Zimbabwe. A deadline for withdrawal was set for 30 May 1975, and the Council met again on this date, but France, the USA and the UK vetoed the idea of sanctions. In 1975 the Portuguese left Angola and Mozambique, changing the situation in southern Africa as the western powers began to fear socialist take over in the independent countries. The South African government negotiated with an Advisory Council in Namibia, which excluded SWAPO, and the Turnhalle Assembly reached a decision regarding a three-tier system of government and independence in 1978. This agreement however failed after it was seen that some apartheid laws would still be in place and there was political change inside Namibia, with parties re-forming. In September 1978 the Security Council passed a resolution finding that UN supervised elections were the only possibility for change. The five western powers on the Security Council visited Vorster in 1977 to discuss change. It was felt that South Africa should loosen constitutional bonds over Namibia and stop Namibian representation in the South African government, but it was agreed that South Africa could appoint an Administrator-General to the area. SWAPO accepted that the Administrator-General and a UN Commissioner would together supervise elections once political prisoners had been freed and discriminatory laws removed. The Security Council accepted this plan in July 1978, but after the South African government carried out an attack on a SWAPO base problems opened up again. The South African government then held internal elections in Namibia in December 1978, which went again the UN elections planned for April 1979. From 1978-1983 SWAPO became increasingly successful with guerrilla attacks in Namibia. The South African Defence Force (SADF) however kept up raids and attacks as well, and SWAPO suffered many political murders while South African rule continued. The elections of 1978 also caused more political problems in the area. In 1981 negotiations between SWAPO and the South African government opened up in Geneva, and were joined by other political groups from Namibia. These talks soon broke down, and conditions inside Namibia worsened with a negative economic growth rate and much violence. Pik Botha proposed called for a regional conference in 1984, but by this time the problems had mounted. The situation in southern Africa had also undergone change after South Africa held talks with the USSR, a ceasefire was agreed on, and the Nkomati Accord was signed. After discussions with SWAPO in Lusaka in 1984 a transitional government was brought into being that was meant to replace the work of the Administrator General. The transitional government came into power in June 1985, which was proof of a deadlock at international level. In 1988 Botha decided to restore the Administrator General to power to try and stabilise the situation. In May 1988 a conference was held in Zimbabwe to establish a plan of action to end apartheid and bring independence to Namibia. It was also at this time that the USA and USSR were discussing changes that would decrease the pressure of the Cold War. The USSR, under Gorbachev, offered to withdraw Soviet involvement from southern Africa and put pressure on Cuba to do the same if the USA brought about free elections in Namibia. The South African government was forced to adhere to the free elections. Negotiations took place in London, concerning the situation in Angola, but these excluded SWAPO. This led to clashes taking place between SWAPO and South African forces, and the Administrator General decided to suspend elections that had been planned. The UN Commissioner worked together with the Administrator General to try and solve the problem, although the UN peace keeping forces had not yet arrived. On 14 September 1989 Sam Nujoma returned to Namibia after 29 years in exile, and elections were planned for 1 November. SWAPO took the majority in the election, with 41 of the 72 seats and 52% of the vote. A committee immediately began work on a constitution, which was finalised by the time of independence of celebrations in March 1990 in accordance with the UN Security Council Resolution 435 of 1978. • Beinart, W. (1994). Twentieth Century South Africa. Cape Town: Oxford University Press. • Davenport, TRH. (1991) South Africa. A modern history. London: Macmillan. • Terre Blanche, H & Illsley, J. (1999) Help U History. Grade 12. Cape Town: Kagiso Education. • Liebenberg, B.J, and S.B. Spies(eds). (1993). South Africa in the twentieth century. Pretoria. • Thomson, L. (2000). A history of South Africa. New Haven: Yale Nota Bene. • Lintvelt, HGJ, Smit, FPJ et al. (1989) Timelines 10. Johannesburg: Maskew Miller Longman.